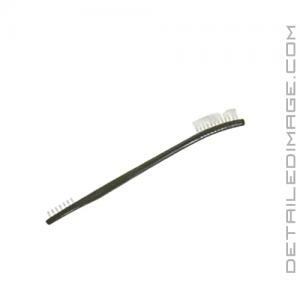 The DI Brushes Two Sided Toothbrush makes removing contamination from hard to reach areas much easier than before. The thin, 7" long handle is easy to grip and features two sets of bristles. One set is located at the top of the brush and is .43" in length. The other set is on the bottom of the brush and .18" long. Both of these sets of bristles are made of white nylon, making them extremely strong and versatile in their cleaning ability. Use each set to reach deep into cracks and crevices, removing contamination that was previously trapped and caked on. Areas such as leather stitching, your dashboard, console, buttons, seat crevices, fabric seats, trim pieces, etc. may be hard to reach, but the Two Sided Toothbrush makes this cleaning a breeze. Don't let fine detailing work get the best of you, pick up the DI Brushes Two Sided Toothbrush and remove dirt and grime hiding in hard to reach areas with ease! Nice little brush for interior in those tight spots that need a little extra agitation. Bristles are durable and its nice to have two different size brushes on one handle for less going back and forth. Cons: saves time by having two brushes in one. Cons: none. Small enough to get in places my other brushes can't and nice, robust bristles, way more firm than an extra firm toothbrush; they won't curl at the ends and become useless. Added this to my interior arsenal because you can never have enough different style brushes for car interiors.